Being Prepared is Having Peace of Mind. Learn more about our mission and vision to protect people by using innovation and putting our clients and people first. An Irrevocable Funeral or Burial Trust is one of the only things that is completely protected when spending down to qualify for Medicaid. An Irrevocable Funeral or Burial Trust is one of the only things that is completely protected when spending down to qualify for Medicaid. It is not considered a “countable” asset when applying for Medicaid. If you or a loved one ever has to go into a nursing home, there is a limited amount of assets that are allowable before applicants can apply for Medicaid. In order to be eligible for Medicaid in Pennsylvania, applicants must have no more than a certain amount of “countable” assets. Many people begin spending down assets in order to qualify. One way in which you can spend down assets is by prepaying or setting up an Irrevocable Funeral or Burial Trust. When setting up an Irrevocable Funeral or Burial Trust, you can prepay for everything that may be needed for funeral and burial expenses. The funds are set aside in a special type of life insurance policy designed for funeral planning and are not countable when determining eligibility for Medicaid. The funds will be available to cover the cost of the funeral and burial expenses at the time of need. The protected funds earn interest (tax-free) until the time of need.When the time comes, the funds are available to pay for the arrangements you selected. Any excess funds are returned to your estate or to the named beneficiary. Start with existing funds from savings or investments. 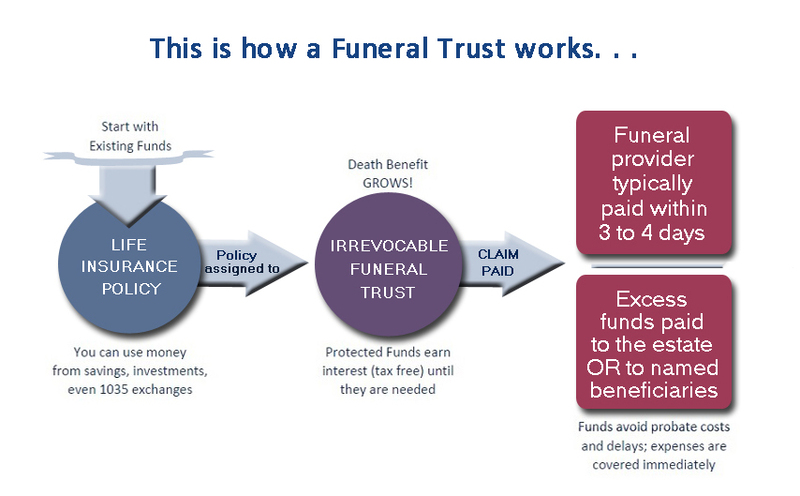 Assign life insurance policy to Irrevocable Funeral Trust. Protected funds earn interest until needed. Funds are available immediately to cover funeral and burial expenses. Excess funds are paid to estate or named beneficiary. Percentage of an average wage earner’s income after retiring that is replaced by Social Security. Percentage of survey respondents in the 53 to 71-year-old age group that have a will or living trust. Percentage of people over 65 that can expect to use some form of long-term care. We work for people just like you that insist on a great experience. We’re aiming to provide you with the financial peace of mind that you deserve. We envision a world where you can be confident of reaching your goals, whatever they may be. © 2019 W.E. Griffith & Associates, LLC. Sign up today for hints, tips and the latest news - plus exclusive special offers.